Fine art, Illustration, graphic design and the art philanthropy of Sam Morrison: River Reading Experiment - First Contact! It's official the River Reading Experiment is a success! (For more information on my River Reading Experiment read my 5/24/05 post). I just received the first of hopefully many more emails from individuals who've found the books and are passing them on. Here's an excerpt from the email I received. "My cousins and I found 3 of you're books on the inlet river to portage lake. We found , "The Photo Drama of Creation", "Kept for the Master", and 'Shepherd of the Hills". We found them on May 29, my birthday! We should of been at church. 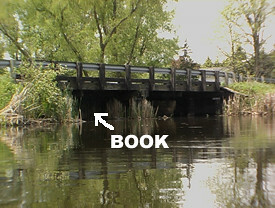 Well any way, we took one of your books home to Munster Indiana to put under a bridge. We live about an hour southeast of chicago. My other cousins are from AnnHarbor Michigan, my grandparents have a cottage on portage lake.We started there and went all the way to kimble lake. We put one of your books way up the river.I'm really sorry but we didn't have a camera take a picture of where we found them.We didn't read the whole book but we did read a few pages of them, there old. My mom and aunt thought that this was absolutly the coolest idea ever.We do ,too. We hope your projectes well. Special thanks to The Inlet Troops. I can't believe it worked either. I thought for sure that idea was going to go down in flames. Whew. I guess it pays to try something new every once and awhile.